Mix up your morning routine with something delicious, such as these Simple Blueberry French Toast Sticks to go along with the Quaker® Real Medleys® Yogurt Cups! These take just a few ingredients you can grab next time you’re at Walmart, along with the yogurt cups in the cold or ready-to-eat cereal aisles. Download the Blippar app from your Apple or Android store to scan your package and receive information tutorials on Quaker® Real Medleys® Yogurt Cups. My family loves Quaker Yogurt Cups because they’re a delicious blend of yogurt and multigrain granola with real fruit and crunchy nuts – Crunchy. Cool. Yum. The first shelf-stable convergence of granola, fruit and yogurt – nothing like this before! Just fill it with COLD milk up to the line inside the cup, stir and let it sit for 2 minutes. Then just stir and enjoy! Serve up these blueberry french toast sticks along side and you’ve got quite the meal to start the day! 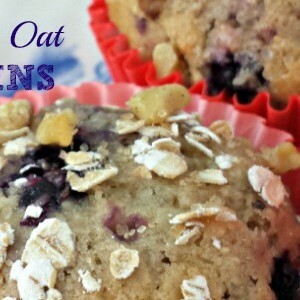 It’s satisfying with 25 grams of whole grains and 10 grams of protein with 1/2 cup of cold Skim Milk. And I love that I can just store it in the pantry until we’re ready for it! They have Strawberry Almond, Apple Cinnamon, Raspberry Pecan flavors. Preheat oven to 375 Degrees F. Spray or line a baking sheet, set aside. Flatten each slice of bread, then add 1 tsp. jam on each slice – just one half a side (so you can roll it up long-ways). 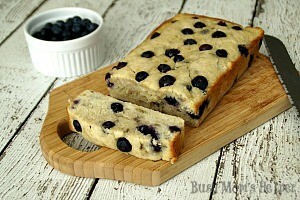 Top the jam with a row of blueberries, then roll it and pinch the edges together. 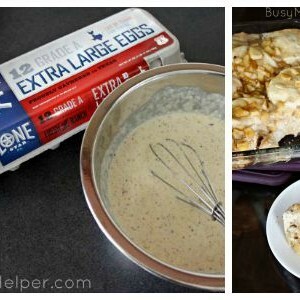 Blend together the eggs, milk, vanilla, flour, baking powder and nutmeg, then place in a shallow bowl. Dip each rolled bread stick into the mixture, letting it soak for a couple seconds. Place on the prepared baking sheet. Bake for 9 minutes. Remove and brush each stick on both sides with melted butter. Return to oven (flipped over to cook other side) and bake another 8-10 minutes. Mix the sugar and cinnamon together. Dip the french toast sticks to coat all over. Serve and enjoy! 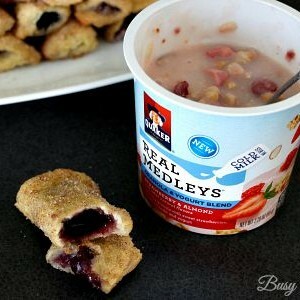 Check out all the delicious recipes with Quaker Real Medleys Yogurt Cups at QuakerRealMedleys.com! Which one’s your favorite? 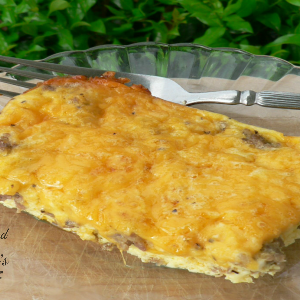 I love brunch – especially since my kiddos wake up so early that breakfast is long forgotten before lunch is even a though! I try to mix it up, and this week found my new Favorite Brunch Recipe: Corn Cakes! 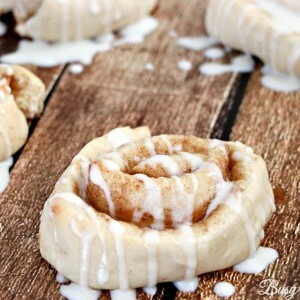 They’re super delicious and way quick to whip up. As I mentioned in my post with the Cornmeal Sugar Cookies Recipe, I’ve been using P.A.N. Cornmeal for inspiration in more of my cooking lately. 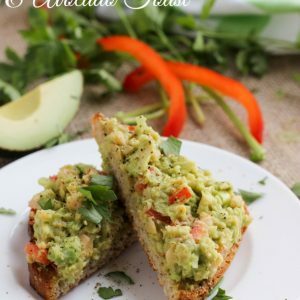 I thought making a seasoned brunch muffin would be just the ticket, and it turned out AMAZING! The flavor is smooth but strong, with the tomato relish balancing it all out perfectly. Preheat oven to 350 Degrees F. Spray or line a 12-count muffin pan, set aside. 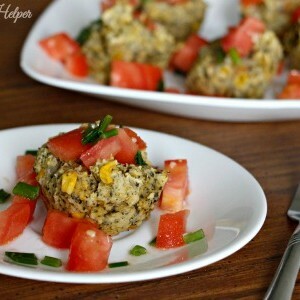 Pour half the can of corn into a blender and puree a bit, then add the rest and blend a little more. You don’t want it all to be mush, but a lot of it with some chunkiness. Scoop into a bowl and mix in the rest of the ingredients until well-blended. Scoop batter into the prepared muffin pan – these don’t rise much, if at all, so fill them full and smooth the tops a bit. Bake for about 15 minutes. While the Corn Cakes are baking, prepare the Tomato Relish (below). Once everything’s ready, scoop some relish over each Corn Cake and enjoy warm! Directions: Mix all of the ingredients together and store any leftovers in the fridge. Seriously, these are incredible! I may have snuck a few in the afternoon, as well – who says that have to just be for brunch, right?! 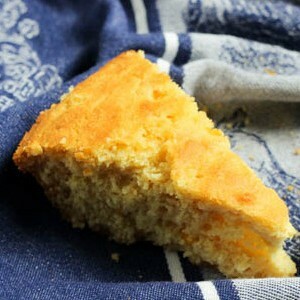 The cornmeal really helps add to both the flavoring AND the texture. Maybe that’s why South America uses P.A.N. Cornmeal as their #1 cornmeal – its rich nutrients and versatility make it an excellent staple in countries all over the globe! For a wide variety of recipes using P.A.N. Cornmeal, visit the P.A.N. Tumblr page! Who else is a big fan of yogurt? Our family loves yogurt, and not just for breakfast like some people first think. 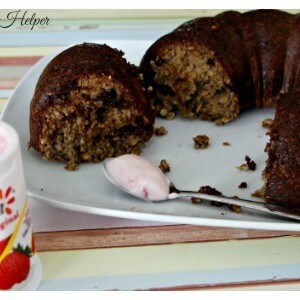 We include it with plenty of our recipes, including wholesome snacks like this delicious Moist Yogurt Banana Bread! With all the popsicles and frozen treats my kiddos will be enjoying this summer, I like to give them filling, no-brain-freeze snacks as well to fuel their fun! This recipe happened slightly by accident – I wanted to make banana bread, and began making my usual recipe – when I realized I was out of flour! Luckily I knew how to fix it, and even tried some of my favorite Yoplait® Yogurt from Walmart to make it totally moist and yummy! While I used their Strawberry Banana variety for this particular recipe, feel free to mix it up with any of their other flavors to see how it turns out. Preheat oven to 375 Degrees F. Spray or line a bread loaf, or other pan of choice (I used an angel cake pan for fun). Set aside. 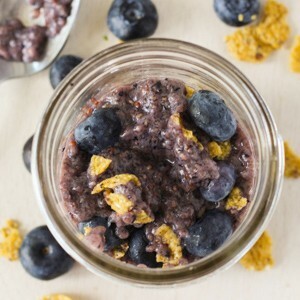 Put all of your ingredients except the oats in a good blender, blending until smooth. Slowly add the oats so they get mixed in well. Pour into prepared pan. Bake for 20-30 minutes, or until a toothpick inserted comes out mostly clean. Serve warm or cooled! We even enjoyed this as an after-dinner snack, as well! I’m packing some up to take with us to the museum tomorrow, which will be a delicious treat for their afternoon. What’s YOUR favorite flavor of Yoplait® Yogurt? Who else is totally stoked for the upcoming Minions movie? My whole family can’t wait – it looks super cute and hilarious! But how could it not be with Minions, right? 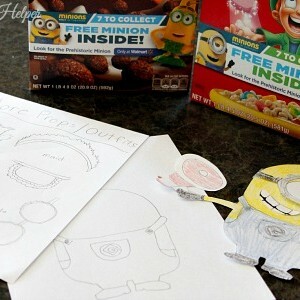 In celebration, have fun with these Make Your Own Minion Free Printables and grab some of the fun guys in your favorite cereal! One thing my kids loved about the Minions in the other movies was how they’d dress up in different outfits – whether it was the hula dancer, maid, golf pro or little baby! When they heard there were toys to be found in some of their favorite breakfast cereals, they were THRILLED! There’s 7 toys you can collect, so grab some boxes and see which ones you get. The special 7th Minion is only at Walmart, so be sure to swing by there! Check for the specially marked boxes – see how the marked ones look in these pics…. I let them open a few different kinds (because how do you get little kids to share ONE Minion toy?) and they sure enjoyed them – they even spent most of breakfast reading over the back of the boxes. I personally love the hula Minion – but when one of them dresses as a maid it’s pretty sweet, too! The favorite in our family, though, has to be the firefighters that yell ‘Bee-Doo, Bee-Doo’! Love them! Here’s the ones we’ve got so far – I can only let the kiddos open so many boxes at a time! They couldn’t wait to Make Their Own Minions with these super fun templates! There’s 7 pages to this download – three different bodies, then sheets with a variety of goggles, hair ideas, arms, mouths, even fun add-ons like the ‘Bee-Doo’ siren lights and maid hat/apron/duster! Which Minion is YOUR favorite – check out if you can nab it as a toy!